Competition requires special teachers, special students, and special parents. It requires time, talent, dedication, and regard for each other as team members. Our combined positive attitude guarantees success. 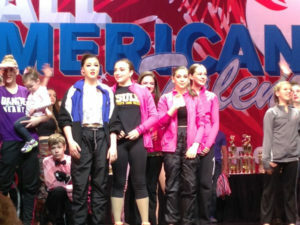 Students on the DANCENTER Competition Team are chosen through audition in the late summer of each year. The students have the option to audition for the class which performs in Jazz or Tap. 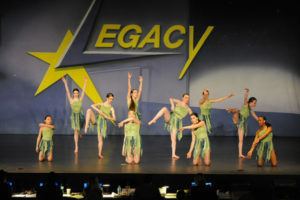 The students chosen to be part of the DANCENTER’S Competition Company are required to attend regional competitions and a may go to a national competition each year. They also perform in our annual end of the year Spring performance and various other small venues in the Utica area. Students who participate on the competition team are given choreographic work to strengthen their technique, performance confidence, and self discipline. Though our students have received numerous awards for their efforts, our studio’s primary focus is to provide a rich learning experience and additional performance opportunities for our members. Dancers currently perform various dance styles including pointe, lyrical, jazz, and tap. The competition team does require time commitments and is by audition only. Production class is Thursday from 6:45-7:30. Additional rehearsals may be scheduled at the discretion of the teachers/choreographers. All dancers are required to participate. No dancer may miss more than three rehearsals during the season. Dancers who need to be excused are required to notify the school 24 hours prior to the scheduled rehearsal. Any dancer excused from a rehearsal is responisble for learning any missed choreography prior to arriving for the next rehearsal. The purpose of the Competition Program at Dancenter is to provide an enrichment program for those selected students who excel in dance and have demonstrated a sincere desire to commit themselves to furthering their level of achievement in dance. Students who exhibit the expertise, talent, discipline, personality, stage presence, attitude and dedication are selected for specialized professional training. Participation in a competition program can be a positive and motivating experience that will provide new opportunities and encourage students to develop their abilities to their fullest potential. In order to maintain the integrity of our Competition Program and provide a positive, fun and exciting experience for our dancers, the following Criteria, Requirements and Commitment Policy has been established. We ask that you read these requirements carefully in order to fully understand the commitment you are making to the Competition Team. Being on the Competition Team will require a commitment and dedication beyond that of our regular schedule of classes. Additional time is devoted to outside class, rehearsals and weekend practices. Regular class and rehearsal attendance is MANDATORY! Effective learning and progression cannot take place with the absence of participating members. Students are expected to arrive to class ON TIME and prepared for dance. Appropriate dance attire and footwear are expected for every class. Hair must be pulled back and secure. NO HALF-TOPS. Students are not to bring food or drink (other than water) into the dance studios. Every student is responsible for his or her own behavior. Class time is very valuable and must be used to concentrate on the learning of dance. Students are expected to maintain open and positive attitudes with a willingness to work hard and learn quickly. A student displaying disruptive behavior will be dismissed from the class. Students competing for Dancenter must compete solely for our organization unless approved by the owner. As you can imagine, competing for more than one studio would be a conflict of interest and cause some extreme scheduling problems. All dancers are expected to arrive at the Competition at least ONE HOUR BEFORE the scheduled performance time. NO EXCEPTIONS! Competitions have been known to run ahead of schedule and fees will not be refunded for missed numbers. Your fellow dance mates count on group effort and it is important that everyone is conscientious of their responsibility to be there on time. Be respectful of the property of others. Pick up after yourself in dressing rooms, lunch areas, etc. and follow the rules stipulated by the event hosts and hotels. Parents and dancers are expected to be respectful of other studios and each other at all times. Unfriendly and rude behavior reflects poorly on the individual and the studio and will not be tolerated. Parental support is very much appreciated by all the teachers; however, it is very important that we respect all teacher decisions regarding costumes, choreography, student coaching, score sheets, etc. Please allow the teachers to focus on their jobs by being supportive. Dancenter staff will handle all communication between Competition personnel and our studio unless noted otherwise. Occasionally parents are asked to assist the instructor with something outside of class. Please do not assume that this gives the child “special allowances”. Parents are responsible for their student at all times prior to and after their performance on stage. Instructors are working with other students and cannot be responsible for attending to students who are not dancing. Parents are not permitted backstage at competitions, unless requested by your instructor. Trophies earned by Soloists will be given to the individual dancer. Duo/Trio trophies will be evenly distributed to each dancer throughout the competition season. Group/Line/Production trophies will be displayed in the studio. Any cash prizes awarded at a Regional or National Competition will go directly to the team. Thank you for being diligent in complying with the above requirements. Working together as a team will make this competition season a positive and enjoyable experience for everyone. As we practice, travel to competitions, meet new friends, and grow together, let us remember to show respect for ourselves and for others by always being supportive of our fellow dancers, parents, and teachers. Teams whose members support one another always stand out as leaders.